What do you do when you book a charter holiday but find that the weather falls short of one’s hopes? The Western Highlands and Islands of Scotland can offer stunning scenery and amazing autumn ‘Indian Summer’ conditions. Unfortunately for friends Norry and Hutch, the promised balmy warm sun that I’d optimistically promised failed to turn up; equinoctial gales from the backlash of tropical storms Lee and Maria put paid to my foolhardy pledge. Norry prefers Mediterranean warmth – she didn’t get it on this trip, though at least she could look forward to a week sailing with friends in the Canaries. I wasn’t envious at all. This was my second charter of the year that had been upset by high winds – our Shetland to Orkney fortnight in June had seen us harbour bound for three days as cyclonic gales lashed the islands. The trick is not to let it upset you or make you hot under the collar. Que Sera, Sera they say – I just wish that I were placid enough to maintain my equanimity when the world turns against me. 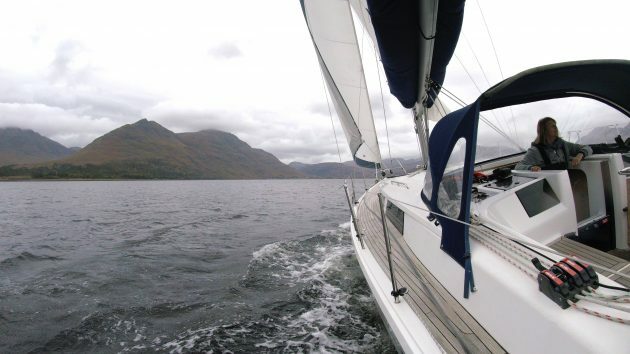 Our October charter was with Torridon Yacht Charter based in Shieldaig, Loch Torridon. The high winds started up soon after we boarded Sula, a Hanse 385. My planned itinerary had to be somewhat modified, and I don’t think we ever shook out all the reefs. We had hoped to head north to Lochinver and Kylescu up in Sutherland, but exposing ourselves to the whim of unsettled weather so far from ‘civilisation’ would have been foolhardy. Fortunately, the islands of the Outer Hebrides and Skye provide a bulwark against the Atlantic breakers for those sailing in their lee so while significant waves can build up in storms, they lack the bite of the open sea. Well reefed, it is still possible to flit between sheltered anchorages in lulls in the wind; while the area is rich in hurricane holes it is important to be aware that downdraughts that can somewhat rock the boat if your chosen wind refuge sits beneath a cliff. We did manage some limited sailing, but counted ourselves lucky to have driven up to Shieldaig; when a day was just too windy we had the option of winding our way through the grandiose scenery in the comfort of the car. On one such occasion, we considered our nautical temerity justified by the lack of shipping, the wind-flattened waves, and driving spray that met our awed gaze through the window at our chosen viewpoints. The way that the car rocked when hit by the blasts of the tempest was another clue. Back aboard Sula, we blessed her heater and comfortable accommodation. Fret not; if your chosen charter is trashed by inclement weather, at least you have hired a comfortable floating cottage that can be safely moored or anchored in the most scenic of situations far from the madding crowd. Ensure that you have a well-stocked larder and drinks cabinet, good walking boots and warm waterproofs, and even gale-strewn holidays can be a pleasure. The post Jonty Pearce: High winds in Torridon appeared first on Yachting Monthly.